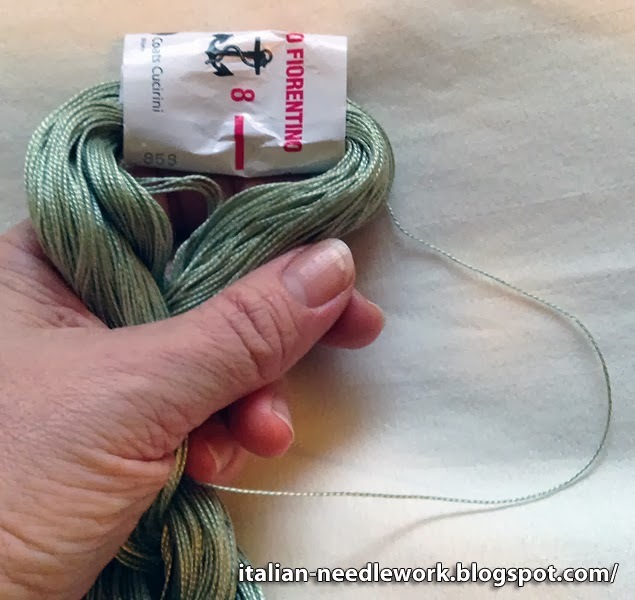 Recently a friend asked me what I do to manage my skeins of Anchor's Ritorto Fiorentino pearl cotton thread which is only available in Italy. 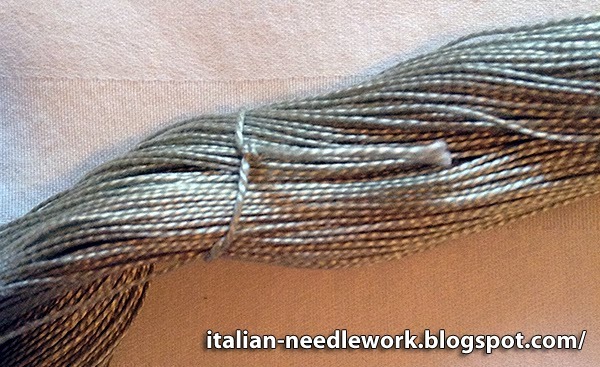 It occurred to me that maybe readers of my blog might have the same question so here below is what an Italian embroidery teacher showed me to do. Sorry the photos aren't the best, they were taken quickly with my iPod Touch. 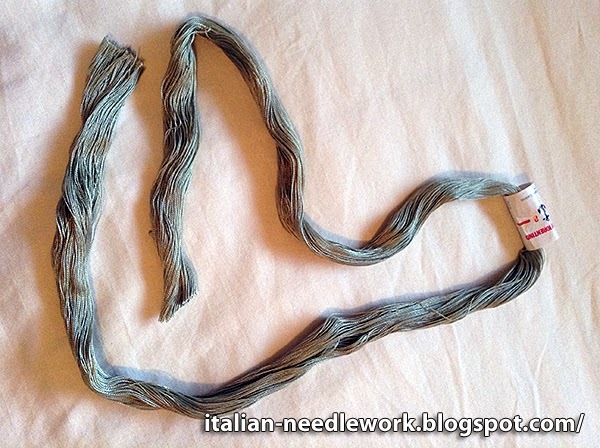 For more information and a review of Ritorto Fiorentino thread, check out Mary Corbet's blog Needle 'n Thread. 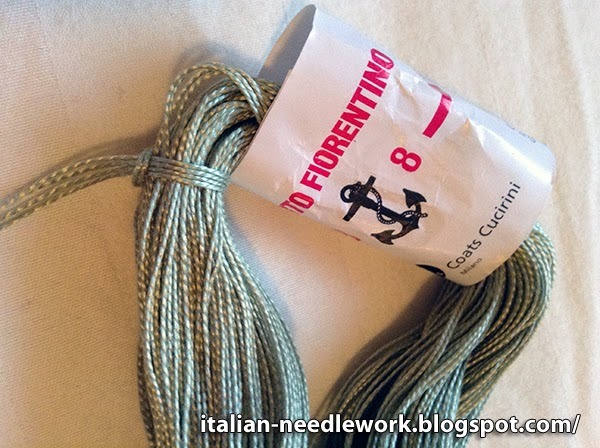 Ritorto Fiorentino is a pearl cotton thread that comes in two weights #8 and #12 just like the pearl cotton thread we know. It comes in hanks of 45 grams which is 350 metres of #8 and 550 metres of #12. I have heard different stories about why it exists but have been unable to confirm any. The legend I like the best is that it was created for the Tuscan market for the embroidery technique of Punto Antico. As works of this type of embroidery generally meant densely covered embroideries on large pieces like tablecloths, there was a need for more thread to complete them. Whatever the story is, they are lovely! 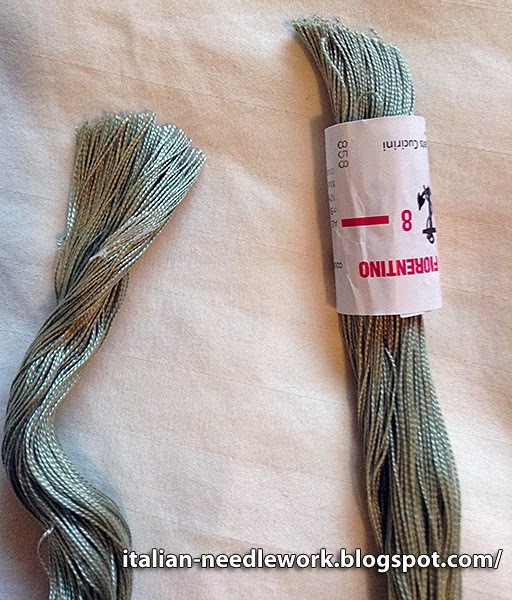 Slide the label off the top of the skein and open it out. Cut the knot and cut through the threads. 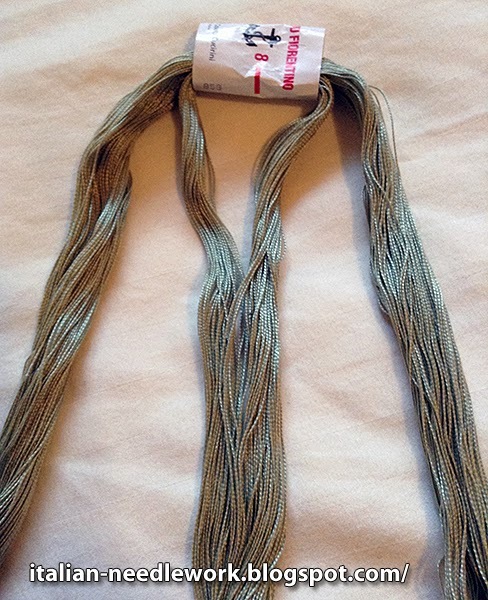 Slide the label on one of the ends of the skein and position it at the middle of the length of threads. Separate a small amount of threads to the inside of each leg on either side of the label. Gather the two smaller sections into the centre to form a third leg and LOOSELY braid the three legs. Near the label separate a single strand with one hand. 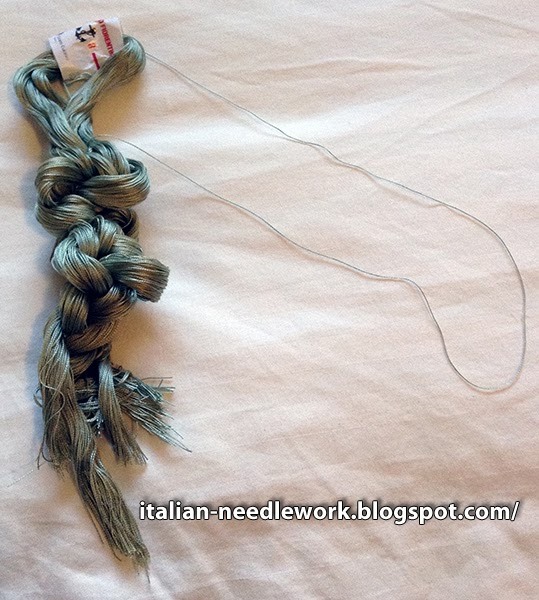 Grasp the rest of the skein firmly in the other hand and pull on the single strand. 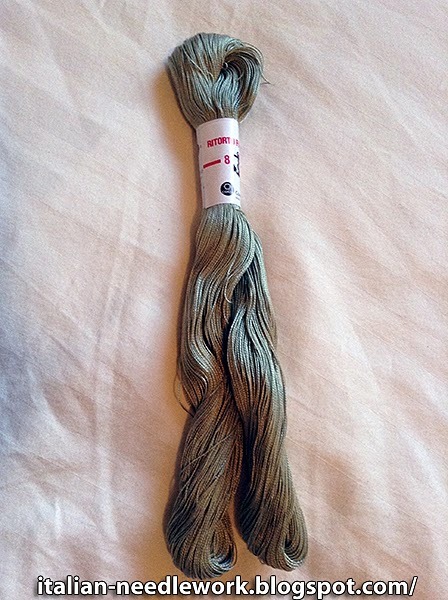 The skein will bunch up but will relax again after you have extracted the single strand. If your braid was too tight this part will be difficult so make sure the tension on your braiding is loose. 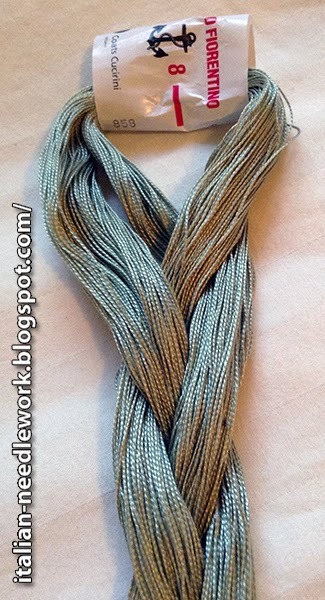 The skein will stay braided. 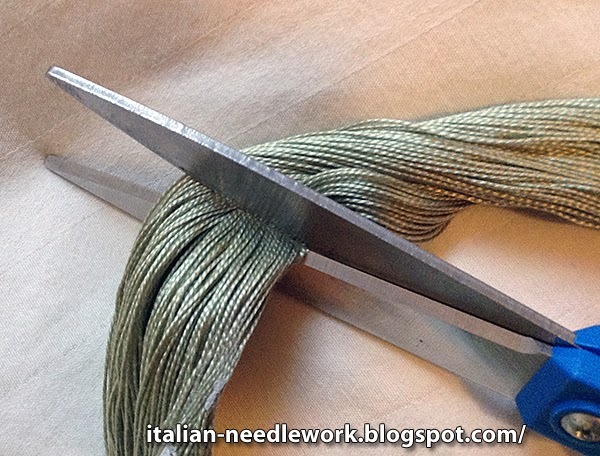 Cut your single strand to your desired thread length, eg. in half or into thirds or whatever you feel comfortable with. The strand is too long to stitch with without cutting it as pearl cotton thread loses its sheen if worked for too long. 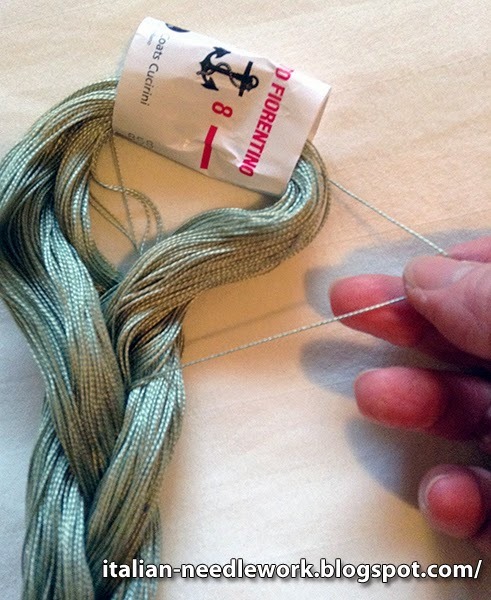 Any unused strands can be attached to the skein using a lark's head knot near the label. You can purchase Ritorto Fiorentino online from Italy from a number of shops like Tombolo Disegni or Casa Cenina. Ritorto Fiorentino is also available in cones for colours like white and ecru.